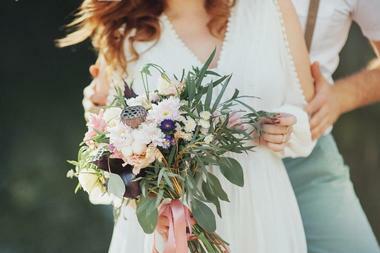 Your wedding is your special day and, of course, you want it to be perfect. Houston has dozens of amazing venues to choose from, guaranteeing you will find something that is right for your wedding. Whether you want to celebrate in a historic building, in a gorgeous hotel ballroom, at a museum, outside surrounded by flowers, or with another type of backdrop, you will have no problem finding your perfect venue. The range of Houston venues includes options that focus on just the reception as well as those that will gladly host the ceremony as well. With so much choice, you are guaranteed to have a day to remember. 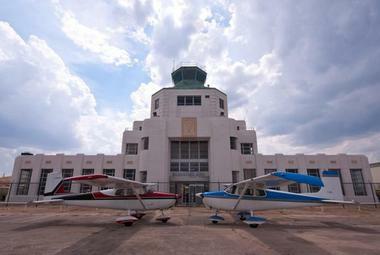 In addition to being a gorgeous building and interesting museum, the 1940 Air Terminal Museum is the perfect place to host your wedding. The structure is architecturally gorgeous with limestone panels, fine stucco designs, an elegant chandelier, and cool marble floors that will look amazing in your photos. 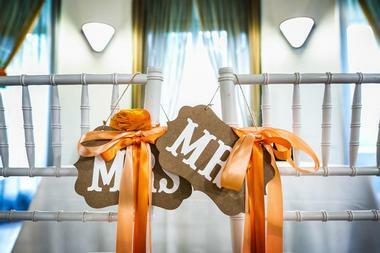 There are multiple spaces throughout the museum that can be rented for your wedding. The gorgeous atrium with its natural light is perfect for your wedding ceremony or reception and can seat 150. For a more intimate affair, consider the Starliner Theater, which seats 50. For a grand celebration, have your reception in the hangar, which can fit over 500 people and a dance floor. 5226 Elm is considered to be one of the top venues for weddings in Houston thanks to its vibrant architecture combined with inviting interior areas. There are floor-to-ceiling windows that allow even events held inside to admire the courtyard garden. Or have part of your event outside to enjoy this area, including a rose-covered walkway, paths, a swimming pool, a rock waterfall, and a koi-stocked meditation pool. All these features and the 20-foot bamboo surround make for amazing pictures. As many as 70 people can dine in the Courtyard Room, and you can kick off the event with an indoor/outdoor cocktail reception. 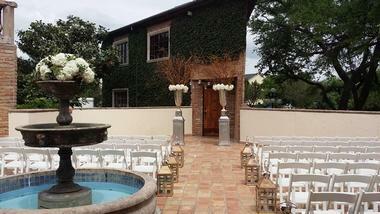 Agave Estates includes a collection of picturesque settings for weddings in Houston and the surrounding area. Agave Real has a gorgeous gated entrance that leads to delicate stone pathways surrounded by landscaping that creates the feel of a tropical retreat. The aquatic features are perfect for photos, and the overall setting delivers the perfect backdrop for the ceremony or reception. 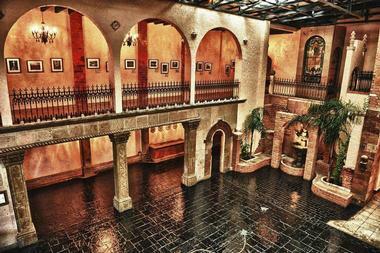 Agave Road sits on 11 acres and this private estate delivers the romance associated with Spanish culture. You will find manicured gardens, palm trees, and more for romance and amazing photos. Agave Estates prides itself on welcoming all couples, including LGBT spouses-to-be. This is just one location of Ashton Gardens in the area and is perfect for weddings, including both the service and reception. The glass-enclosed chapel is distinctive and offers a romantic, brightly lit setting to say your vows. The reception ballroom delivers stunning views of fountained courtyards, lush greenery, and surrounding trees. You can choose to have an intimate ceremony followed by an elegant reception in the spacious ballroom, which holds as many as 400 guests. There is a spacious built-in dancefloor and an eye-catching presentation staircase. To make wedding planning simple, Ashton Gardens has its own 5-star executive chef to cater your dream wedding meal. The Asia Society Texas Center in Houston has multiple spaces to choose from for hosting your wedding. The Fayez Sarofim Grand Hall is a gorgeous setting for banquets or receptions, with the ability to seat up to 100 people at tables. The Edward Rudge Allen III Education Center can seat between 40 and 210 people in a banquet setting. Couples love the Water Garden Terrace, with its space for 90 in a banquet and amazing views of the water garden. Those interested in an outdoor ceremony or reception can choose from the Chao Fountain Green Garden or the Sterling-Turner Festival Lawn, the last of which can seat as many as 300 guests. The AvantGarden is a bar and lounge with a social patio and the perfect setting for cozy, picturesque weddings. 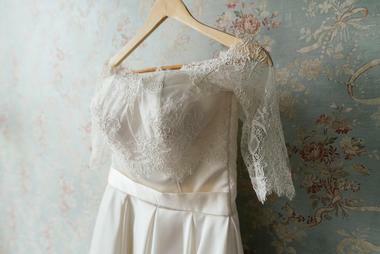 It has eclectic styling that makes it ideal for those in search of a unique environment for their wedding. The two-story building has plenty of history and a bohemian flair with a mix of antiques. You will love taking photos by the front porch garden, while the open patio at the back is a great setting for the reception. This venue gladly works with you to create a unique theme for a memorable wedding and includes valet service. The space can easily accommodate 160 guests or more. The Chateau Cocomar is the ideal wedding venue for those in search of an elegant affair that makes you feel like a princess on your special day. The Chantilly Chamber features a handsome fireplace, crystal chandelier, lavish accents, and gleaming surfaces. 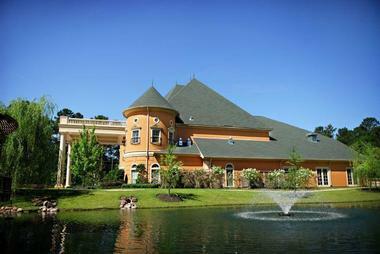 In the center of the chateau, you will find the picturesque WakeCo Jardin surrounded by manicured English gardens, creating a tranquil experience ideal for your wedding ceremony or cocktail hour. The Salle de Valencay offers a chic contemporary ballroom with an imported French Tiffany skylight, French ornate moldings, and five antique gold and crystal chandeliers. The Salle de Versailles creates an Old World feel with its hand-painted gold-leafed walls and murals inspired by Venice. You will want to take some wedding photos in the Verona Foyer as well. 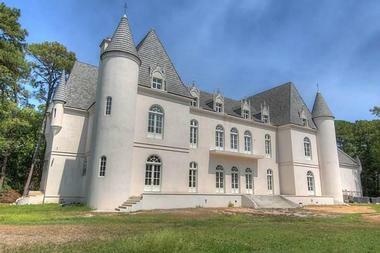 Chateau Polonez is an exquisite venue popular for both wedding ceremonies and receptions. The venue is in the European style for a classic flair. The dramatic double staircase lets you make a grand entrance and is perfect for photos, while the vaulted ceilings and faux-painted walls deliver a space to remember. Have the reception in the spacious Grand Ballroom and explore the 5 acres of manicured gardens and naturally wooded areas, perfect for relaxing before you say “I do” or snapping some photos. The Grand Ballroom can fit 240 guests downstairs with an extra 112 on the upstairs balcony. For smaller affairs, curtains can be drawn to seat as few as 20 without feeling overwhelmed by the space. 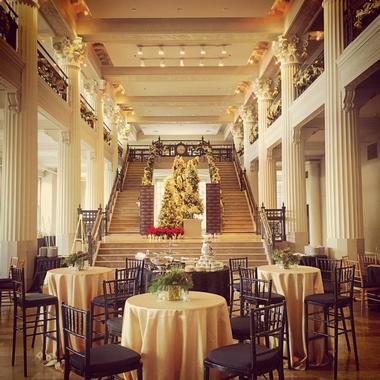 The Corinthian lets you get married in a dramatic and historical venue with full service. The building was completed in 1905 and shows off amazing architecture within the downtown Historic District. The Corinthian sits on the first floor as well as the mezzanine. The soaring Corinthian columns that reach 35 feet tall are the focal point, reaching up to support the ceiling with its intricately decorated plaster, an original. The rear Palladian window is framed by a double staircase ideal for photos and a special entrance to the ceremony or reception. As a full service venue, the Corinthian offers catering via their partner, giving you one less thing to worry about. Hotel Derek is a boutique hotel that offers a wedding venue as well as a place to stay for your honeymoon. The luxurious suites are perfect for your first night together as husband and wife. There are multiple wedding venues to choose from, including a ballroom with space for 350 during a seated dinner. Your wedding reception always includes extensive catering, a complimentary bridal suite including a bottle of champagne, chauffeured car service, your overnight accommodations, and full access to the hotel for photos plus dedicated staff. 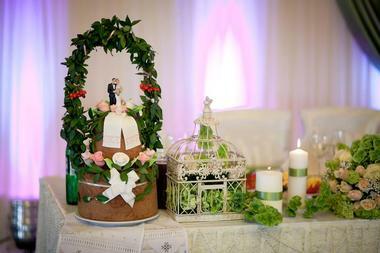 There are a range of wedding packages available, including options for dinner, cocktail hour, drinks, and more. Hughes Manor combines industrial-chic décor with modern luxury to deliver a timeless setting for your wedding. There is enough space for both the ceremony and reception, including plenty of set-up and clean-up time. Your wedding rental includes beer and champagne or whiskey in the private rooms and wedding suites, high-definition TVs to show a slideshow, seating for up to 200 outside and the same number inside, gorgeous chandeliers, and plenty of time for photos. To save you time, Hughes Manor has approved caterers to choose from and your choice of bar packages. Between the interior and exterior spaces, there are more than enough options for photos. Las Velas reminds visitors of Tuscan villas from the 17th and 18th century, making it a picturesque location for your perfect wedding day. It showcases serenity, elegance, and grandeur and is filled with spectacular fountains and lush gardens. Your photographer will likely take some close-ups of the hand-carved stonework as well. Las Velas has been hosting events for over two decades, giving them more than enough experience in making your day truly special. Whether you want an intimate ceremony or a lavish reception, this venue can take care of your day. The venue always includes linens, tables, napkins, gold chairs and chargers, silverware, glassware, china, a valet, a bridal/groom suite, candles, and security. Catering and beverage services are also available. Magnolia Hotel Houston has been rated among the top new hotels in the world and is a historic landmark from 1926. Following extensive renovations, it is better prepared than ever before to host your wedding and ensure you have a perfect day. The Magnolia Ballroom is magnificent and the hotel offers professional planning services. They can host your bridal luncheon, wedding reception, and rehearsal. You will find signature menu items created by the executive chef. 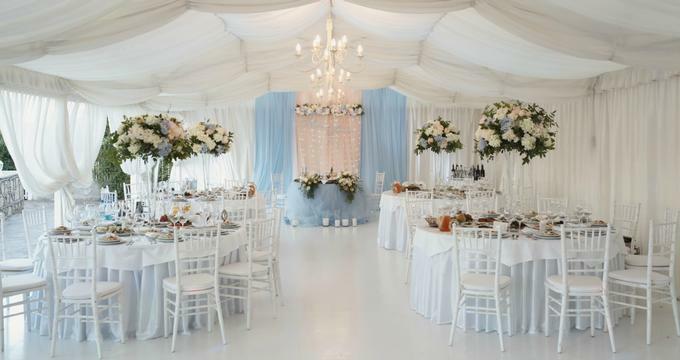 The ballroom’s neutral color palette and subtle finishes work for nearly any theme. There is room for 200 guests without a dance floor or 180 with. You can also use the ballroom for the reception and seat 330 people. For a wedding in a gorgeous location, look no further than the Nouveau Antique Art Bar. Since 2009, they have been serving as a fun bar in the area as well as a wedding venue that will leave your guests admiring the décor. 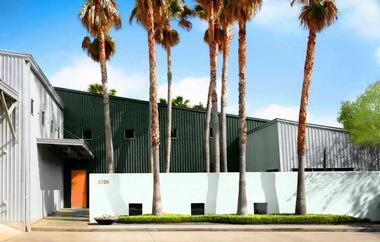 The 4,500-square-foot space is full service and is conveniently located in mid-town. The décor combines the atmosphere of a neighborhood pub or bar with art nouveau. It even has one of the largest collections of Tiffany reproduction lamps in private hands. Imagine the amazing photo opportunities framed by these lamps. There is no shortage of parking either, so your guests have one less thing to worry about. 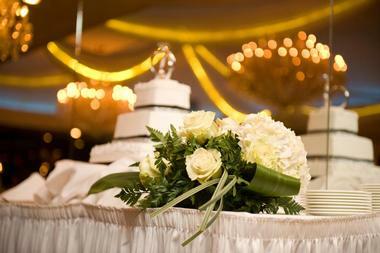 Having your wedding at Omni Houston Hotel gives you access to as much as 39,744 square feet of room for your event. In practicality, this means that you have less of a chance of your chosen day being taken since there is space for multiple weddings. The Regency Ballroom has over 10,000 square feet along with a pre-function area complete with floor-to-ceiling windows. The Grand Salon covers 5,175 square feet and the Colonnade Ballroom has 3,760 square feet. 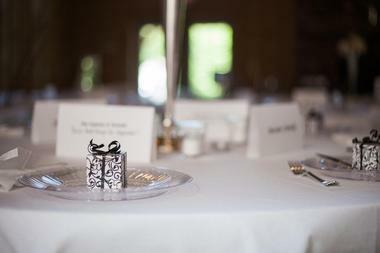 The hotel is perfect for everything from the bridal shower to the rehearsal dinner to the wedding reception. Just go upstairs to get to your honeymoon suite. 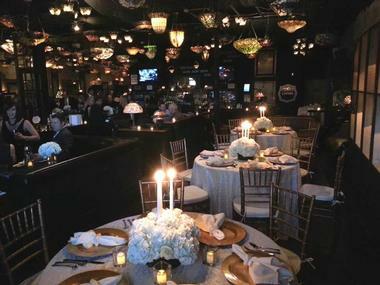 Pelazzio Reception Venue is known for its elegance and charm. Your wedding will feel cozy, sophisticated, intimate, and worldly all at the same time. It is a full-service venue with more than 15 years of experience, during which time it has hosted thousands of events. Their dedicated team of certified event specialists are on site each day of the week so your special day goes off without a hitch. There are four wedding reception halls to choose from, combining elegance with affordability. They can host 75 to 550 people and accommodate weddings from all cultures; South Asian wedding are a specialty. With the Houston skyline framing your view in every direction from its spot on the 35th floor, the Petroleum Club of Houston has spectacular views to make your special day even more amazing. During the ceremony, the space can host between 100 and 180 guests. For the reception, you can fit as many as 80 guests in Suite A, the Aramco Room, or as many as 250 in the Petroleum Room. The staff have years of experience managing events and ensuring they run smoothly and the exceptional valet service ensures no one has to search for parking. You can select your menu, varying from traditional to opulent options, and choose the beverages you want. The Astorian is within a landmark building and covers 14,000 square feet of industrial chic space within the Heights area. It was designed to replicate NYC’s Grand Central Station and has clear influences from art deco design and 1920s glamour. The bi-level facility is contemporary with state-of-the-art smart technology, 14-foot ceilings, floor-to-ceiling windows, a private boardroom, and a completely functional gourmet kitchen with bar. The soft lighting and wood paneling warm up the space, mixing perfectly with rust steel, concrete floors, and brushed aluminum. The fixtures and walls are removable, so you can customize the space for your wedding in any way you want. The Bell Tower on 34th has dozens of professional awards from The Knot, Weddings in Houston, and more. 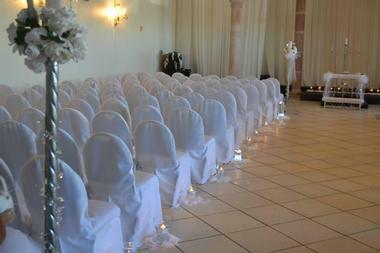 When you choose to have your wedding here, you will have numerous options for spaces, from ballrooms to ceremony rooms. Each wedding experience is completely customized so you can choose the space you want, the number of people you will host, your menu preferences, and more. The consultation is all about you and time is taken to ensure that your special day is perfect. 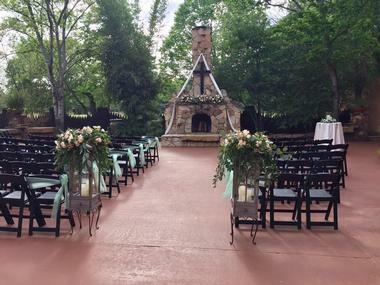 There are also available additions like a photo booth, candles, a wood-burning fire in the fireplace, love seats, flower pedestals, and more. The Gallery is decorated in a French Mediterranean style that you and your guests will admire long after your special day. The venue includes both indoor and outdoor settings, all of which are filled with Old World charm and surrounded by distinguished architecture. You will enjoy the elegant space with its privacy. Guests are welcome to explore the various interior rooms, gardens, and outdoor patios. The interior spaces can seat 300 people for dinner with even more room in the other areas. For the most seamless experience, get a wedding suite so that the venue takes care of linens, catering, the bar, a planner, security, outdoor lighting, décor, and more. 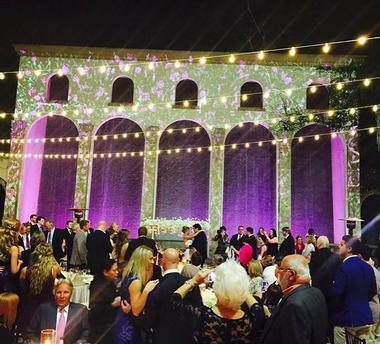 The Gardens Houston is a premier event venue that provides a gorgeous backdrop for your wedding or other special event. There are four event spaces to choose from and you can even rent decorations. 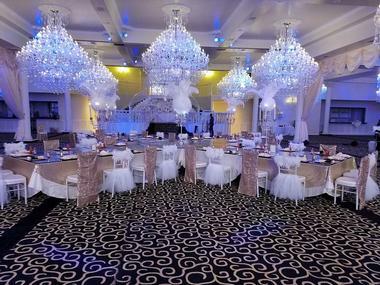 The ballroom has a 900-square-foot dance floor and room for 150 seated guests to enjoy dinner. The Garden Room can hold 250 guests for dinner and has a private atrium that is perfect for photos. Or fit 300 guests into the Grande Ballroom with its 1,500-square-foot oak dance floor. 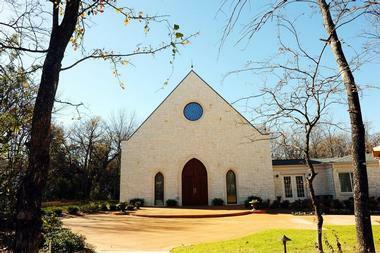 The chapel holds 200 guests and is perfect for the ceremony. To make your event go seamlessly, the Gardens Houston also has catering services. 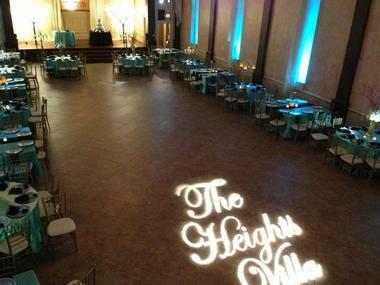 The Heights Villa has 30,000 square feet divided into two separate venues. No matter which ballroom you choose for your special day, you will get access to a luxury suite, lounge, bar, courtyard, and buffet room. As the ballrooms are separate, you will have complete privacy during your wedding. You always get your choice of over 50 tablecloths, gold Chiavari chairs featuring brooches and ivory decorative wraps, round tables, specialty lighting, centerpieces of your choice, and more. 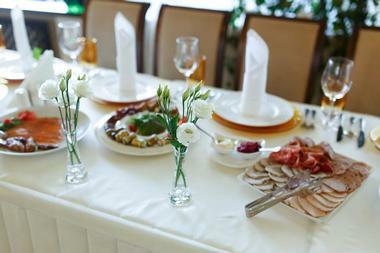 You can choose one of the three suggested caterers or bring in your own for a small fee. There are also a range of bar packages available. 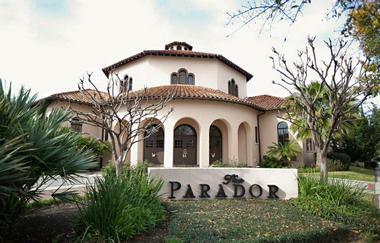 The Parador is a historical landmark in the museum district that is perfect for hosting your special day. It is a Texas Historical Landmark as well as a premier event venue in Houston. The building has two separate spaces that can adjoin for larger events. Each space has its own garden or courtyard, which you can reserve separately if you want. The building dates back to 1928, with architecture that combines Byzantine details and Mediterranean style, giving you unique wedding photos. The Duomo has room for 200 guests under the 35-foot dome and is perfect for a buffet, seated dinner, or cocktail reception. The Cloister Room also holds 200 guests in this 3,000-square-foot area with a private courtyard. You can also have a ceremony with 220 guests or a dinner party with up to 150 in the gardens. 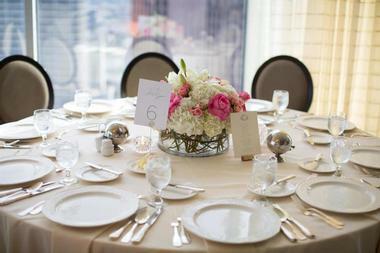 The St. Regis Houston is a boutique hotel as well as a charming event venue perfect for hosting your wedding. The spaces are designed to enhance upscale Texan style with high-end notes for a gorgeous backdrop. 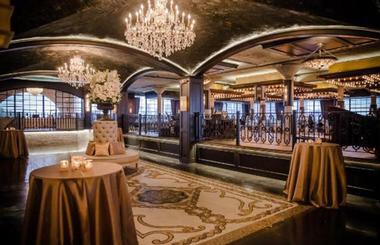 The Astor Ballroom shows off elegance and redefines “Texas Chic,” with room for 250 guests seated for dinner. The wedding menu is created with the culinary team to work for your particular tastes, always paying attention to small details so that your meals will be a hit. You can make your day your own, including preparations such as rejuvenating spa treatments and hand-selected floral treatments.